NEW Pink Floyd Ukulele Slide Comfortably Numb first solo by Wayne Sorbelli at Island Guitar Music Store in Key West Florida. I stayed after a day of teaching guitar and ukulele lessons at my music shop in Key West and decided to play along to some Pink Floyd backing tracks that I have. Pink Floyd has long been one of my favorite bands, and David Gilmour one of my all-time favorite guitarists! The way he bends and shakes the notes gives his guitar a human vocal quality that very few guitarists can achieve. One of my favorite guitar solos of all-time is Gilmour’s first solo on Comfortably Numb – so I thought it’d be appropriate for my new experiment – Can I play this epic famous solo with my glass finger slide on my guitar? Then, when reaching for my guitar I saw my ukulele sitting there and decided I’d give it try on the tiny baby guitar like instrument instead? lol Why Not? – then I thought it would cool to try with my glass finger slide ON THE UKULELE! I am a guitar player since 1980, guitar repair and set-up guy since 1996, music store owner and operator since 1997, and guitar teacher since 1998, bass teacher since 2000, & ukulele teacher since 2004. I’m sliding with my pinky wearing a glass slide, Dunlop 212, on one of my favorite playing and sounding guitars, my Dean Soltero. 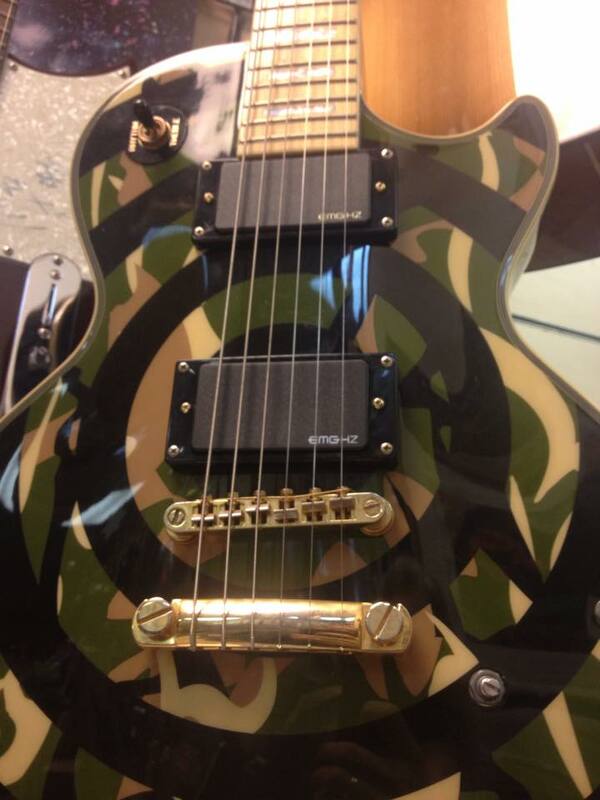 I stayed late after a great day of guitar and ukulele lessons at our local Key West music shop and added some KILLER TONE TRICK MODS and an AMAZING set up on this already amazing Les Paul Custom Zakk Wylde Camo signature Epiphone guitar. I’d say that my favorite thing about it, is the maple neck AND fretboard! A little weird at first – it feels kind of like a tele maple fretboard. Wayne Sorbelli here at my music store in Key West jamming some blues in Am using my glass slide finger and Luna Cedar Top Ukulele. I’m in standard soprano ukulele tuning GCEA. I didn’t change anything about the uke, it’s a regular setup on an off the shelf Luna Cedar Top ukulele with nylon strings. I’m sliding with my pinky wearing a glass slide Dunlop 212. We are a full service music store for those who play, those who want to to learn play, and for bars, clubs, churches and places that have public speakers, performers and live bands. MUSIC SALES RENTALS REPAIRS LESSONS. Instruments, Accessories, Drum heads, Strings, tubes, cables, stands etc etc.